The California roll is a delicious alternative to traditional sushi rolls that can be found in just about any Japanese restaurant in the United States. Because it is often prepared with cooked imitation crab, it is regarded as a starter roll for people new to sushi who are not ready for raw fish. You can’t walk into a sushi restaurant without finding the California roll on the menu. Despite their prevalence in sushi culture, the history of the roll is enigmatic. The most commonly accepted creator of this roll is Ichiro Mashita. Mashita was a Los Angeles sushi chef in little Tokyo. His early version of the California roll dates back to the early 1960s. At the time, he implemented the standard wrap with nori seaweed on the exterior of the roll, but Americans would often remove it thinking it was inedible. As a result, the reverse roll with rice on the outside was born. At the time he created the roll, imitation crab was not available, so he used real crab. Sesame seeds, cucumber, and mayonnaise were also absent from the original recipe. Ken Seusa is another chef from Los Angeles who asserts ownership of the innovation. He has the earliest documented claim for the California roll, and per food writer, Andrew F. Smith, the claim stood uncontested for more than 20 years. Chef Hidekazu Tojo from Canada claims to have started the version of sushi in which the rice is on the outside of the roll. His claims also include the addition of cucumber, cooked crab, and avocado, which can be seen as support for his claim since those are the current ingredients of the California roll. 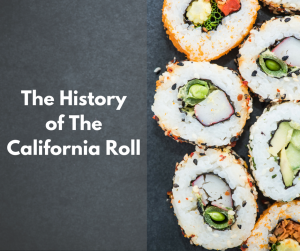 Due to its incredible innovation and simple design, the California roll went on to become a popular dish in Southern California. By the 1980s, it was widely known across the entire country. The California Roll is a great option for anyone interested in trying sushi without consuming raw seafood. If you’re looking to enjoy a delectable California Roll or other sushi plates in the Orlando area, Sakura Sushi should be your first choice. We pride ourselves on offering fresh, quality sushi, and a traditional Japanese experience. Book your table today at 407-352-1607.